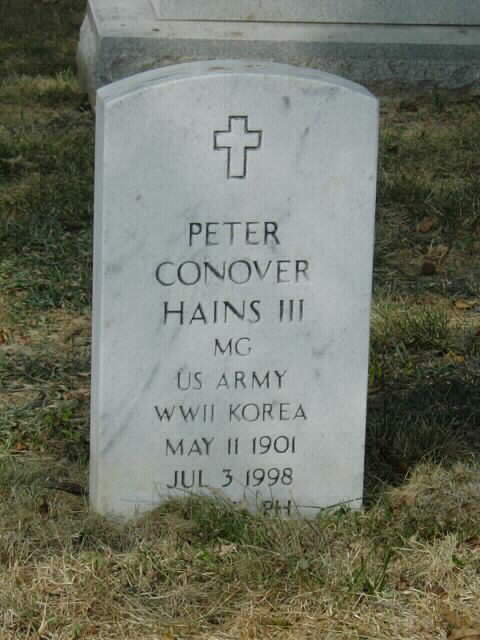 Peter C. Hains III, 97, an Army Major General and former Olympics participant who retired in 1961 as deputy chief of staff for plans and operations in the Pacific, died July 3, 1998 of congestive heart failure at the Fairfax at Fort Belvoir, Virginia. He was born at Fort Banks, Massachusetts. He was a 1924 graduate of the U.S. Military Academy at West Point. He was a member of the U.S. Olympic pentathlon team in 1926 and the 1932 equestrian team and later helped prepare other pentathlon teams for world competitions. As a young cavalry officer, he participated in 37 steeplechases and won or placed in all but one. General Hains served as commander of the First Armored Regiment in North Africa during the war. He was also armored adviser for the European invasion and then was assigned to the Pacific to help plan an invasion of Japan. After the war, he was assigned to Washington as deputy director of the office of the secretary of defense. General Hains was later deputy commanding general of the Second Army, chief of the military assistance advisory group in Yugoslavia, chief of staff of the Fourth Army and chief of the military advisory group in Thailand. His honors included a Silver Star, a Distinguished Service Medal, three Legions of Merit, two Bronze Stars, a Purple Heart and an Army Commendation Medal. Survivors include his wife, Bernard Montgomery Hains of Fort Belvoir; four children, retired Army Colonel Peter C. Hains of San Antonio, Ada Louise Waldron of Destin, Fla., John N. Hains of Suffern, N.Y., and Dr. Fred O. Hains of Wellesley, Mass. ; eight grandchildren; and four great-grandchildren. 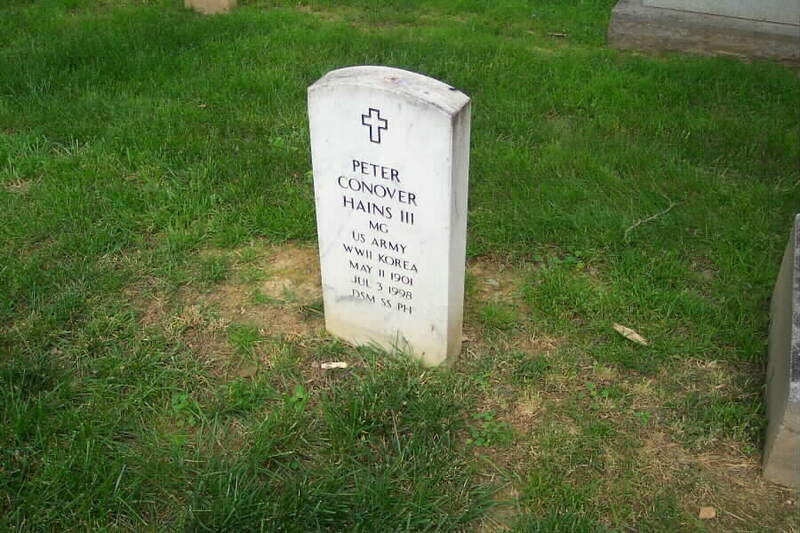 Note: His wife died in 2005 and was buried in Arlington National Cemetery on 14 November 2005. On Friday, July 3, 1998. 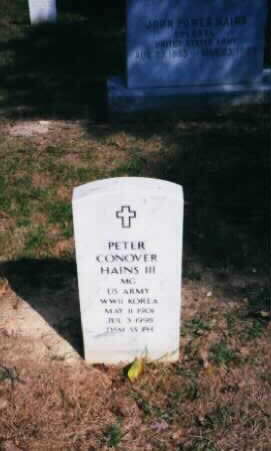 Beloved husband of Bernard M. Hains; father of Col. Peter C. Hains (Retired. ), Ada Lou Waldron, John N. Hains and Fred O'D Hains, DDS. Also survived by eight grandchildren and six great-grandchildren. Interment Arlington National Cemetery. In lieu of flowers, contributions may be made to St. Labre Indian School, Ashland, MT 59004-1001 or Army Emergency Relief, 200 Stovall St., Alexandria, VA 22332-0600. His Grandmother and Grandfather, Major General Peter Conover Hains, 1848-1921, and Virginia Pettis Jenkins Hains (1848-1923) and another unknown type of relative, John Power Hains, Colonel, United States Army (August 23, 1865-March 25, 1964), who is buried adjacent to Peter Conover and Virginia Hains.